CRA’s Committee on the Status of Women in Computing Research (CRA-W) works with other broadening participation in computing partners to more effectively reach underrepresented minorities. Distributed Research Experiences for Undergraduates (DREU) is a highly selective program that matches promising undergraduate women and members of underrepresented groups with a faculty mentor for a summer research experience at the faculty member’s home institution. 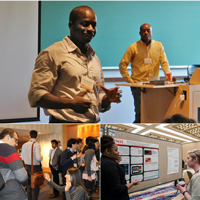 Collaborative Research Experience for Undergraduates (CREU) provides research stipends to teams of students from underrepresented groups working on research projects under the guidance of a mentor at their home institutions. The CRA-W Distinguished Lecture Series (DLS) sends faculty and industry researchers to campuses to encourage women and minorities to attend graduate school. Get your school to apply! CRA-W Grad Cohort for Women and Underrepresented Minorities and Persons with Disabilities Graduate Cohort Workshop programs hold workshops intended for Computer Science and Engineering students in their first years of grad school. Students meet for two days with 10-15 senior researchers who share pertinent information on the transition from student to researcher as well as more personal information and insights about their experiences. Richard Tapia Celebration of Diversity in Computing Conference, which highlights the technical contributions and career interests of diverse people in computing fields. CRA was the original sponsoring organization of what is now the Anita Borg Institute’s Grace Hopper Celebration of Women in Computing, which celebrates the technical contributions of women in computing. NSF’s Black Women in Computing Workshop. CRA analyzes the health of the computing research talent pool and evaluates the effectiveness of intervention programs intended to grow this pool by surveying, comparing, and analyzing computing departments and individuals. CRA’s Education Committee (CRA-E) provides support and resources for ensuring a healthy pipeline of domestic students who continue to graduate school and research careers. CRA-E activities collect, analyze, and interpret data; and disseminate findings to the community. Projects include identifying and developing best practices and resources for undergraduates in research and graduate school, and making junior faculty aware of existing mentoring and best practices resources by running workshops at research conferences. CRA’s annual Taulbee Survey serves as the principal source of information on students and faculty in Ph.D.-granting computing departments in North America, including the enrollment, production, demographics, and employment of Ph.D.s in computer science, computer engineering, and information programs. It is the trusted source on data regarding masters and undergraduate enrollment and degree production, as well as salary and demographic data for faculty. CRA’s Center for Evaluating the Research Pipeline (CERP) collects semiannual survey data from a national sample of students enrolled in computing programs across the U.S. in order to gauge students’ experiences in their degree program and in the computing community. Within each sample of data, CERP has the capability to compare success outcomes among students who have versus have not participated in a particular professional development program in computing research. Thus, thanks to the CRA, the computing community now has access to a national sample of data for comparative analysis of diversity and other initiatives in computing. CERP staff also utilizes their national survey data to conduct basic social science research geared towards developing best practices for promoting persistence among all computing students at the postsecondary level. Low Diversity in Tech: How Did It Happen and How Do We Fix It? CRA Launches New URMD Grad Cohort Workshop – Apply Today! The Distributed Research Experiences for Undergraduates Application is Now Open! Want to explore the Data Buddies data?